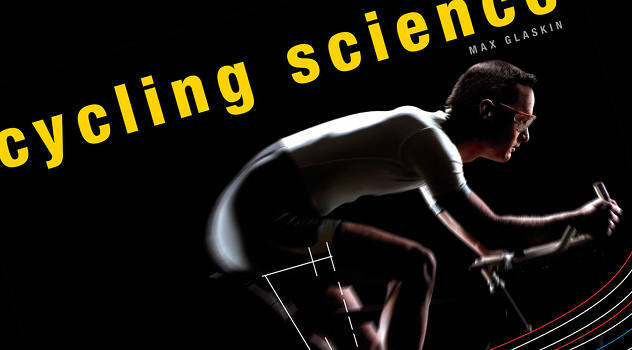 I picked up a copy of “Cycling Science” by Max Glaskin not long after release. Having more than a passing interest in what makes everything tick when we ride a bike, I expected it to be just the thing, but unfortunately I was left disappointed. Physically it’s well presented – a square hardback just shy of 200 glossy full-colour pages. It covers a wide range of material, from the fundamentals (balance, efficiency, etc) through the materials used to construct a bike, friction and various other losses, aerodynamics, and the biology of the human body. While there’s a lot of good stuff in there, too often I found myself frustrated by what is presented. There are too many inconsistencies or inadequacies that are not explained, and in a book of this nature, that’s just not good enough. It may be super shiny, but this book has too many issues for me to seriously recommend. The almost-fascinating page on cog size and efficiency presents two changing variables: the size of the cogs and the pedalling force. Which is having the effect? Who knows! The section on chain lubes shows that friction is not impacted at low power under lab conditions. The book mentions that everything would change in real conditions, but doesn’t take the discussion any further than that. Useful only if you ride in lab conditions? The section on tyres discusses the coefficient of friction (which is independent of contact area) and in the very next paragraph states that increasing the contact area makes for more grip. Why? Not for any reason that’s presented, that’s for sure. The page on braking shows the use of both brakes gives faster deceleration than the use of the front brake alone. Since you can use the front brake to decelerate so hard that the rear wheel lifts off the ground (contributing nothing), how this can be so is a mystery to me. Probably it’s a flaw in the underlying study, but it would be nice if the conflict with theory was mentioned somewhere! In the section comparing riding positions, it’s stated that Chris Boardman would have gone 33.7km in the hour if he’d ridden with conventional aerobars instead of his ‘superman’ position (which was good for 56km). That is, if Boardman rode a normal TT bike over a conventional 40km course he’d be expected to take over 70 minutes. In reality 50 minutes in closer to the mark. This leaves only questions about the page, the book, everything. I could go on, but it seems unfair. One possible defence might be that the references section contains the answers to all my questions (and more), but I find this unsatisfactory, doubly so given the book’s target market, which is more of the coffee table than pubmed crowd. I mean, what are you supposed to make of a statement like “elite cyclists [who use SPDs are] enjoying an 86 per cent gain in mechanical effectiveness” followed immediately by “[this] consumes disproportionately more of the rider’s resources”? What sort of measurement is being used that says pulling up on the pedals is both more efficient and less efficient? There are ample studies showing that in real life, the pros don’t pull up with their feet anyway! So what’s the verdict? It’s shiny, but overall it’s pretty hard to recommend. Anyone want a lightly used copy? I haven’t read the book, so I don’t know if the author included an illustrative braking forces diagram or not, but the mathematics are a bit complex. Using both brakes will give higher deceleration than the front alone for the condition where the tyre-road friction coefficient for the front wheel is suitably lower than that of the rear wheel. The two (different) constant-friction regimes intersect at a point at which lock-up of both tyres is immediately followed, and this represents the limit of braking for any given physical specification of bike and road-tyre interaction. If both tyres are equally grippy, where the traction coefficients and tyre-road friction coefficients are all equal, the limit of braking of course becomes the point at which the rear tyre normal force reduces to zero, thus just begins to lift off the ground. Achieving that condition purely with the front brake on anything other than a straight, level road takes some skill as we all know!